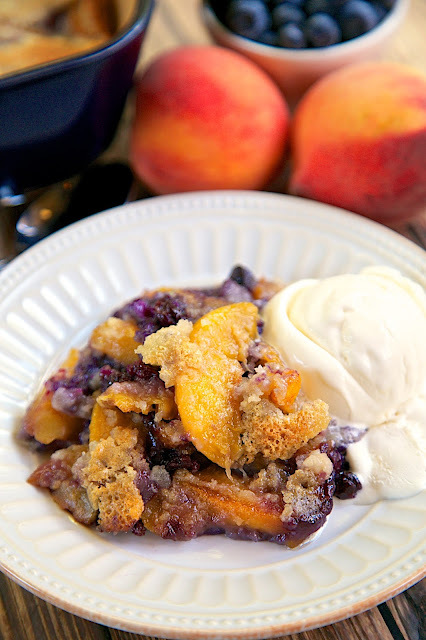 Country Blues Peach Cobbler - peaches, blueberries, butter, Martha White Blueberry Muffin mix - super quick and easy dessert - can use fresh or frozen peaches and blueberries. 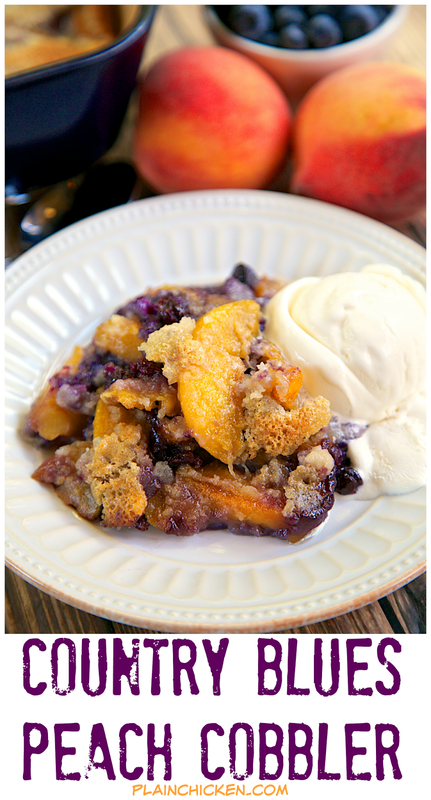 Serve with ice cream for a delicious dessert! I just got back from a few days in Nashville. I went up for The Southern Baking Retreat hosted by Martha White & White Lily. It was SO much fun! I met lots of fabulous bloggers. We had a great time baking with Martha White & White Lily products and experiencing Nashville. We had an amazing dinner at Husk. I am still dreaming about that dinner. After dinner, J. Michael Harter and his brother gave us a private concert. They were awesome! For breakfast the second morning, we ate at the Phunky Griddle. It is kind of like the Melting Pot of breakfast. There are hot griddles in the middle of each table and you get to cook your own eggs and pancakes. There are tons of fun toppings to add to your pancakes. I chose Butterfingers and peanut butter chips! YUM! It was a great time in one of my favorite cities. This recipe was inspired by my trip to Nashville. 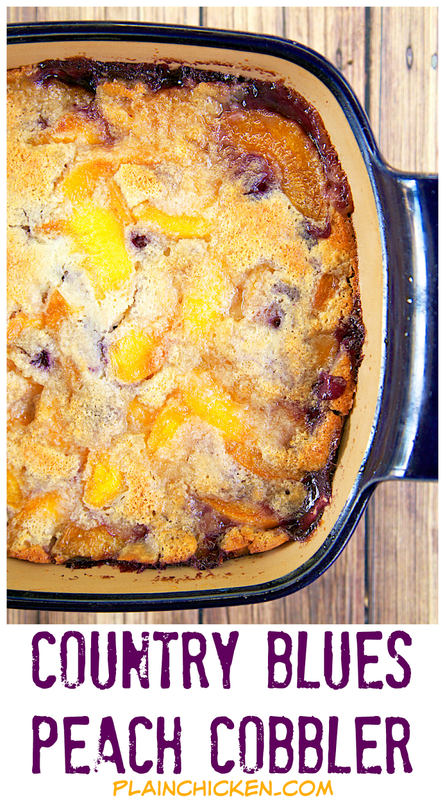 It is a super quick cobbler recipe that uses a pouch of Martha White® Blueberry Muffin Mix. It only takes a minute to whip up! 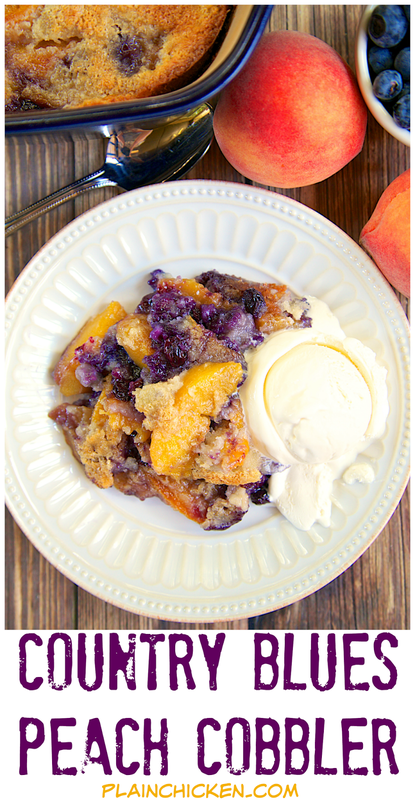 I used fresh blueberries and peaches, but frozen will work great too. This is best served warm with a big scoop of vanilla ice cream. YUM!!! This didn't last long in our house. 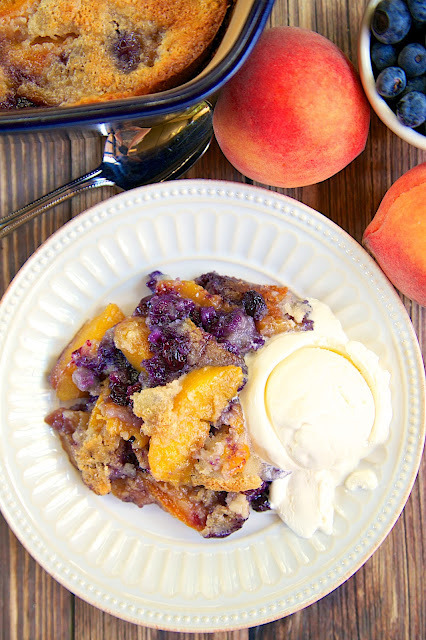 Yield: serves 6Author: © Martha White Foods, Inc.
Stir together peaches, 1/2 cup sugar and water in large bowl. Set aside. Place butter in 8x8-inch (2-quart) baking dish. Place in oven until butter is melted. Stir together muffin mix 1/4 cup of sugar and milk in medium bowl, just until blended. Remove baking dish from oven. Scatter blueberries evenly into butter. Pour batter evenly over butter and blueberries. Do not stir. Spoon peaches over batter. Pour 1/3 cup of peach juice over batter. Do not stir. Bake 40 to 45 minutes or until golden brown and bubbly. Serve warm or cool with whipped cream or ice cream, if desired. My mouth is watering here! 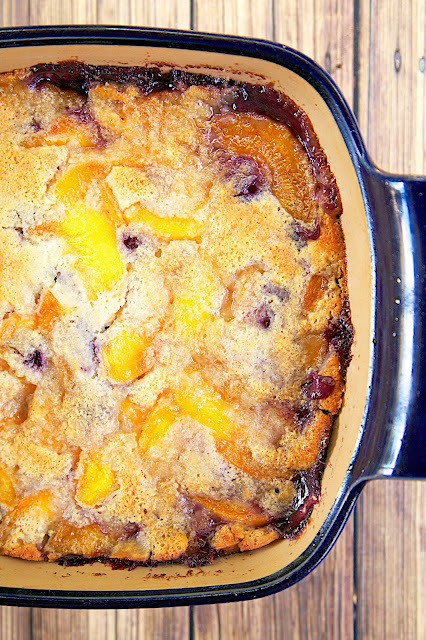 I think I have to make this - all my favorite stuff in this cobbler. I hope I can find the mixes here in the NW.